Are you searching for Faculty Teachers Andhra Pradesh 2019? 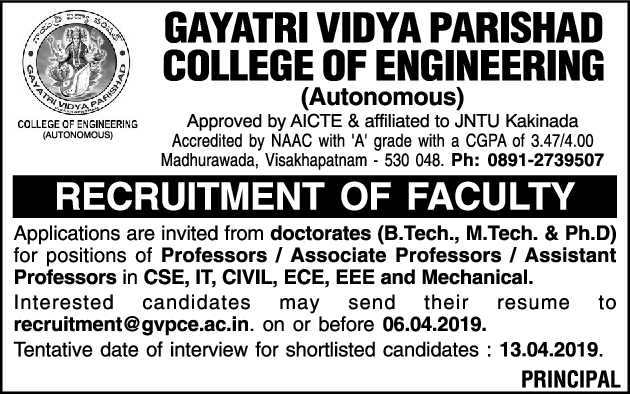 A college based in Visakhapatnam named Gayatri Vidya Parishad College of Engineering, Visakhapatnam has advertised in THE HINDU newspaper for recruitment of Professor / Associate Professor / Assistant Professor jobs vacancies. Interested and eligible job aspirants are requested to apply on or before 06th April 2019. Check out further more details below. About College : The GVP College of Engineering, Visakhapatnam started in 1996, has very quickly established itself as one of the most-preferred private engineering colleges in Andhra Pradesh. College has been accredited by NAAC in 2009 with an A grade (with a score of 3.47/4.00). The college has been sanctioned “Autonomous” status by the UGC and conferred by the affiliating University, JNT University, Kakinada in 2009. GVP College of Engineering has 7 UG Programs, 13 PG Programs and 8 Departments were recognized as Research Centers by the affiliated University, JNTU-K, Kakinada. All the 7 UG programmes are accredited by NBA and 5 of them are accredited as per Outcome Based Education (OBE) and 5 PG programs are applied for NBA as per OBE.